Obverse depicting the rider saint slaying a female demon. Reverse depicting an evil eye being attacked by animals from below and by daggers from above. Drawing and card catalog entry for small finds from Tomb 30. The amulet is drawn frontally and from the side on the lower right corner. 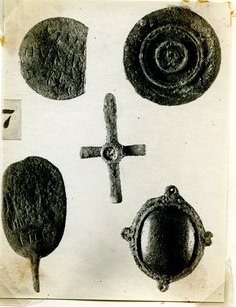 Photograph depicting a number of jewelry items from the 1922 excavation season of the Northern Cemetery tombs. The Rider Saint Amulet is depicted upside down in the lower left corner. This bronze amulet, complete with loop hole for suspension, was designed to magically protect its wearer from demons, the evil eye, and curses. Its obverse side features the 'Holy Rider' figure spearing a female demon with the text "εις θεος ο νικ(ων) κα(κα)" ("The one conquering evil through God"). This was a common motif in Late Antiquity and was used to protect both a woman’s womb from miscarriage and children from demons and sickness. The reverse side features an evil eye being attacked from above by several daggers and from below by two lions, an ibis, and a scorpion. The evil eye was (and still is) known across the Mediterranean as an envious or hateful look that can cause misfortune. Date: 300 – 400 C.E. Bonner, Campbell. Studies in Magical Amulets. Ann Arbor: The University of Michigan Press, 1950; no. 303.